Working with SSIS and the BI Stack from Microsoft I have discovered a few tips and tricks that come in quite handy. To my surprise a lot of these are not very well know in the BI World. In this series I am going to try and post one or two SSIS Tips and Tricks on a weekly basis. 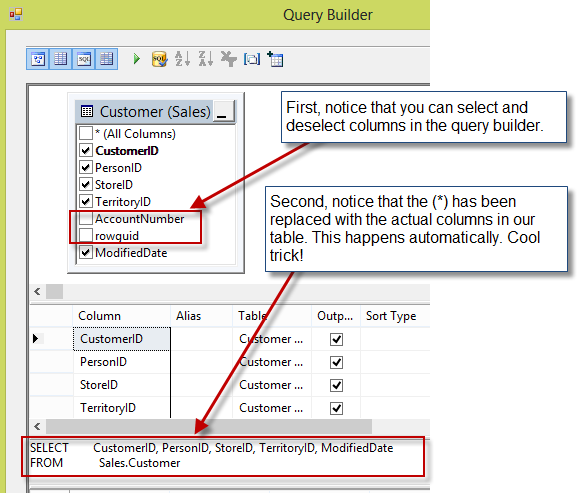 As you are well aware the SELECT * syntax in SQL Server should not be used inside of SSIS. This is because the metadata in SSIS is very rigid and if you add or remove columns to the table in your select statement it can affect other transforms in the pipeline that have been defined with very specific metadata properties. So if you are like many people who use SSIS it’s likely you alt + tab over to SQL Server Management Studios and then view the table and write your select syntax there with all the applicable columns for your query. Then you copy that syntax and alt + tab back over to BIDS / SSDTs and paste. It’s unfortunate that there isn’t some kind of tool inside SSIS that will assist us with our incredibly difficult predicament. Just kidding, of course there is, if there wasn’t I wouldn’t be blogging about it! Let’s demonstrate. First – Open up your OLE DB Source component in your data flow and write your Select * from table statement. 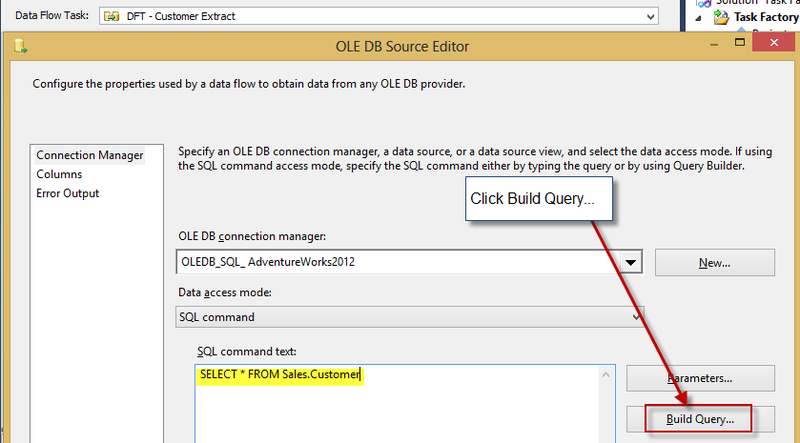 For this example I used SELECT * FROM SALES.CUSTOMER in the AdventureWorks2012 database. Next click “Build Query…” found on the right side of the OLE DB Source Editor. Click ok and you are done! Thanks for looking and check back for more time saving tips and tricks. Load thousands of files in SSIS lighting fast! MultiFlatFile Connection Manager.